Went for an evening walk today. Usually I go during the middle of the day or around 2pm. Today went with a friend at around 4:30pm. It is a nice hike around our workplace. Since we were going in the evening, the hills were alive. We saw wild flowers, bunnies, birds, squirrels and bunch of beetles. We were surprised with the amount of critters roaming around today. Then we were engrossed in our talk and I stopped suddenly and I look ahead, there it was a 2-3 feet rattle snake. Probably a baby (apparently babies are more aggresive. ), lying across the trial. We both were speechless for a minute. Another 2 steps, I would have stepped on the snake. Still don’t know what stopped me. After taking a good look, we returned back without finishing the loop. Didn’t want try stepping over it. Snakes give me the heebie jeebies! Anyway, allz well that ends well! And, finally I got to see a rattle snake in wild!! Yay!! ps 1. Looks like husband’s is not lucky. If he was, I would have stepped on the rattler and he could have finally got rid of me! We have a history of mourning doves in our backyard. A couple of years ago a couple of mourning doves made the lampshade in our backyard their home. We were glad to see them build their nest and tend their eggs. 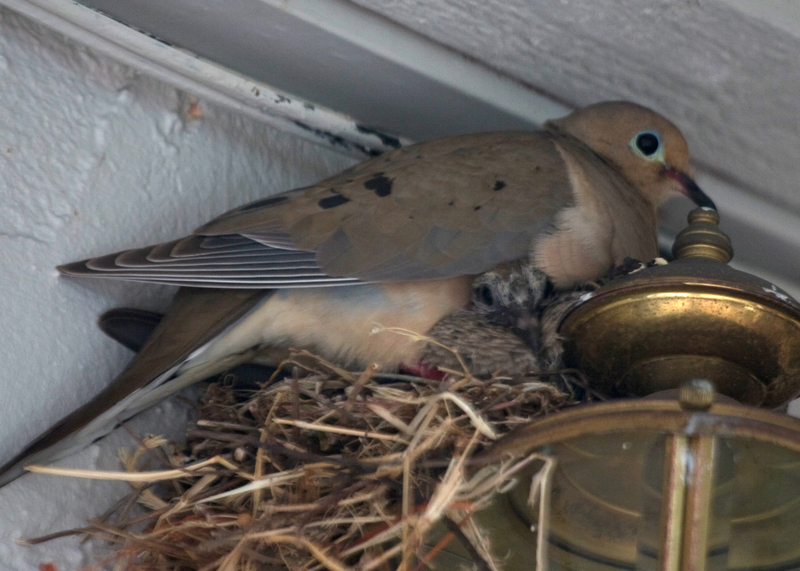 The mom and dad dove used to take turns in keeping the eggs warm. It was so beautiful to see. And one fine morning, the doves went missing, abandoning the eggs. There is no way to explaning the grief it caused us and husband/I were feeling guilty wondering if we chased them away without our knowledge. Then this year, another couple(maybe the same), came and laid their eggs and tended their eggs and produced two beautiful offsprings. We were glad to see the babies learn to feed, walk and fly out of the nest one fine morning. Then a month back, another couple(maybe the same) made the nest their home. Maybe word has spread that our backyard is the moaning dove maternity ward. The babies were born 10 days back. 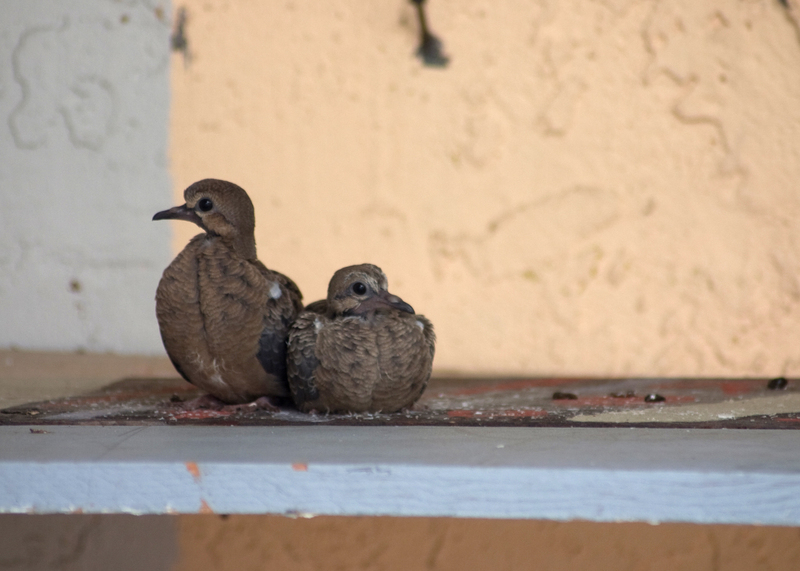 This morning, they had flown down from their nest to our workbench and the babies were practicing walking and flying. They were alone all morning. At around 2pm, I felt bad for them and made one of the mistakes of my life. Went to leave some grains near them. One of them(the elder one) got scared and flew away. It is around 4pm and it hasn’t returned 😦 . So I am in mourning.